Planit is a modern planning app that allows users to track various aspects of their lifestyle in a fun, unique way. Bullet journaling is a phenomenon that has taken off in recent years, and it has inspired many students across the world. However, as the creativity and adaptability of physical journaling has developed and the culture has become more complex, many planner apps have failed to keep up. With Planit, we aim to create a new kind of agenda app. Our focus was on creativity, intuitive design, and many fun updates to come! We wanted to build an app that related to the new bullet journaling community in a unique and fresh way, while also keeping the speed and cleanliness that comes with digital planning products. Planit is the scheduling app for the busy, yet creative individual. With the app, you are able to view your entire year, a month, a week, all the way down to a single day. In the daily view, you can view, create, and tag any event for the day. This allows you to organize your daily schedule however you would like, from food and water intake to school assignments to complete. Other tags include gratitude reminders, exercise, and budget constraints. In the monthly view, you can look ahead to the dates of the selected month, allowing you to plan your responsibilities accordingly. 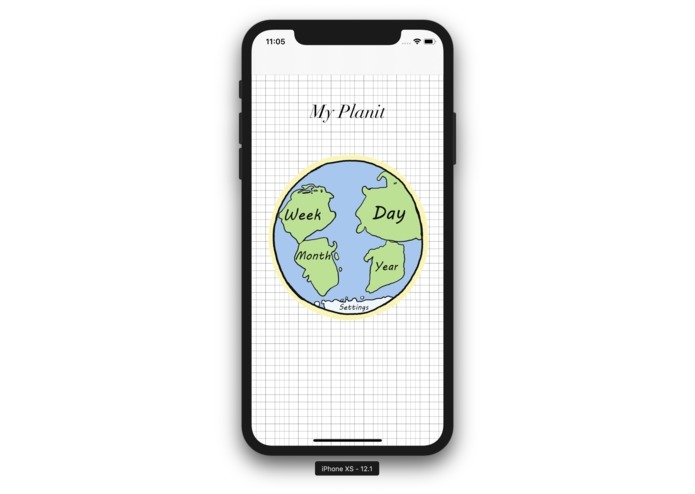 This app began in a sketchbook, designing what we wanted the interface to look like, what features we wanted it to have, and any other customizable options that we wished to implement. From there, we began designing the screens that would be displayed to the user, from general layout to specific icons. All icons are hand drawn by our team graphic designer, and the layout was customized and implemented by our team programmers. This process was full of repeated testing and trial and error of new code that make our product truly unique. Our team ran into multiple errors when syncing our project between computers over GitHub. Additionally, our designer does not own a Mac, which knocked the team down one potential programmer. However, through much googling and trading of ideas over snacks and water, we were able to discover new ways to deal with these problems that resulted in the app we are now submitting. Given that this is the first Hackathon our team has attended, we are satisfied with the amount of work we've been able to accomplish. The graphical development of this project is something that all of us were very involved in, and we are all extremely proud of the outcome. Behind this graphical design, however, is the intricate functionality that we have had to learn during this short timespan. We were able to discover how to implement a Calendar API into our app. The language Swift and the IDE Xcode are also concepts that are new to this team, and we have learned much about both during the course of this Hackathon. We learned the fundamentals of iOS app design, with the new IDE Xcode. 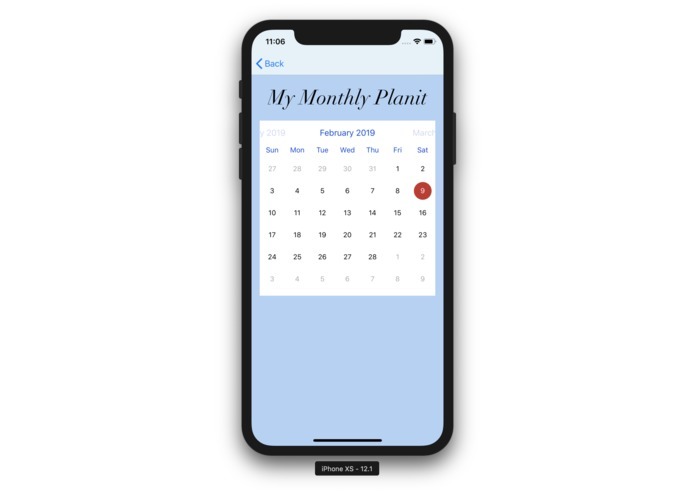 API implementation was also a new concept, which we were able to learn through the use of a Calendar API in our monthly planner view. One of the most important parts of this project was learning about our teammates and time management with short term projects. Collaborating and focusing on the different individual skills of each team member was crucial in the development of this project, and, if nothing else, is something that we will be able to take out of this experience. We have a running google document of all the updates that we're going to make to this app. 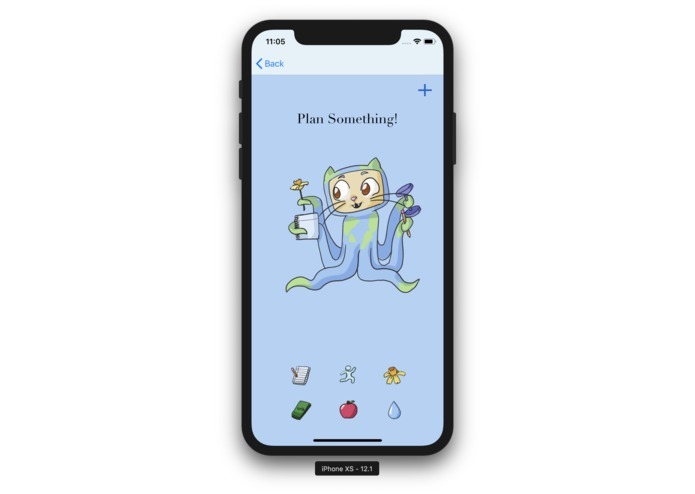 Some of our most ambitious objective include using snap kit to add stories to gratitude events, which would also lend itself to creating group gratitude events that could be shared across multiple planits, syncing to the phone's local activity tracker to update exercise scheduling, and creating customizable themes that users could choose in their settings. Other, smaller goals include polishing the tagging system, adding customizable names to the planits, and be able to add more optional tags to the scheduling system.